A 14-car accident in Markham was one of roughly 100 crashes reported across the Chicago area Wednesday morning as freezing drizzle turned major roadways into sheets of ice. The multi-car accident took place during the morning hour near Interstate 57 and 158th Street. It was not immediately clear if there were any injuries, but video from the scene showed at least 14 cars involved in the crash. The entire metro area was put under a Winter Weather Advisory until 9 a.m. warning of a glaze of ice on roadways, parking lots and sidewalks during the morning rush hour. More than 100 crashes, jack-knifed semis and spin-outs were reported as drivers hit the roads early Wednesday morning. "Drive at slower speeds and be prepared for vehicles losing control around or ahead of you. Please do not go out on the roadways unless absolutely necessary," Illinois State Police said in a warning to drivers. Major incidents were reported on southbound Interstate 294 in Western Springs, where an accident blocked all lanes near Ogden Avenue just before 6 a.m. On the northbound side numerous accidents shut down lanes near the Hinsdale Oasis. 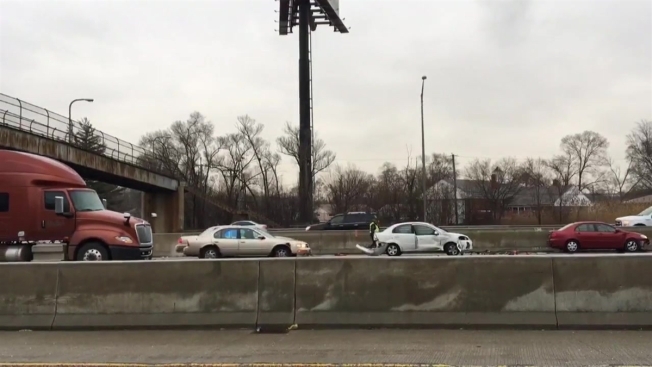 On eastbound Interstate 80 near Tinley Park, about 20 cars were involved in various accidents near Harlem Avenue. Some vehicles were reported to be in ditches. State police later shut down westbound I-80 just before the Harlem Avenue exit so salt trucks could cover the roadway. Tinley Park Police confirmed one person was killed in a crash at 175th and LaGrange Road when a car and semi collided. Further information on the crash wasn't immediately available but LaGrange Road was closed in both directions between 179th and 175th Streets. Dozens of accidents were reported across Will County, particularly near I-80 and I-55, where multiple lanes were blocked. Numerous crashes were also reported on the outbound Stevenson Expressway in Joliet and Countryside. Illinois State Police warned that I-55 was at one point down to one lane each way after numerous crashes near Route 52. Several injuries were reported in the crashes but no fatalities, according to District 5 police. In DuPage County, nearly 20 crashes were reported in about 15 minutes everywhere from Bartlett to Wheaton to Lombard to Carol Stream. Indiana state police warned that road conditions were particularly slick on I-65 and urged drivers to be cautious. Numerous crashes were reported on the roadway, particularly in the area of 61st Avenue to US 30 in Lake County. "Freezing conditions have made the interstate, ramps and bridges slick and icy," police said in an alert to commuters. "Four wheel drive and driving a semi will not help you in these conditions!" Black ice forms when the temperature is 32 degrees or colder outside. Temperatures Wednesday morning sat in the mid- to upper-20s. Since cars can't gain traction on ice, AAA says it's even more dangerous than snow. Officials recommend that drivers do not hit the brakes in the event their vehicle begins to slide on black ice.